During a free-flowing and often self-congratulatory speech Saturday at the Republican Jewish Coalition’s annual leadership conference, President Donald Trump slammed freshman representatives in Congress, accused asylum seekers of being “scam” artists and once again said his son-in-law Jared Kushner was the most qualified person to secure peace in the Middle East. Over the course of the hour-long performance, Trump frequently went off-script, jumping from topic to topic while taking opportunities to drop names and insult his political critics and opponents. 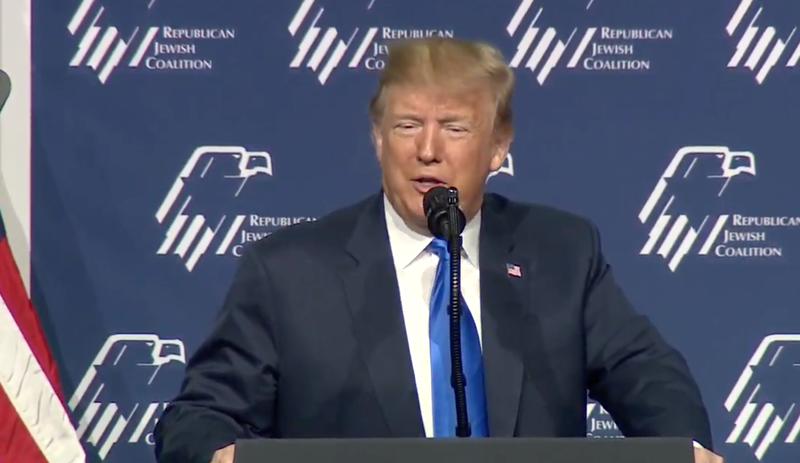 During his opening remarks, Trump made disparaging comments about Minnesota Rep. Ilhan Omar. He also lambasted Freshman Rep. Alexandria Ocasio-Cortez for working as a bartender before running for Congress. “Green New Deal! Proposed by a wonderful young bartender—29 years old,” he said, referring to Ocasio Cortez. The president’s comments regarding asylum seekers echoed the harsh remarks he made during a visit to the southern border city of Calexico, California, on Friday, denegrating migrants seeking to cross into the U.S. not as refugees, but con artists. Trump expressed his disbelief that burly men with tattoos on their faces were truly in any peril back in their home countries. Instead, he told the audience, he believed these asylum seekers were the ones causing the trouble. In regard to brokering peace between Israel and Palestinians, Trump assured the audience that his son-in-law Jared Kushner, who had no previous diplomatic or political experience, was the best person for the job. “I would like to see peace in the Middle East. If those three can’t do it, you’ll never have it done,” Trump said, referring to Kushner, Israel advisor Jason Greenblatt and U.S. Ambassador to Israel David Friedman. At one point, Trump touted his administration’s efforts to withdraw from the Iran-Nuclear deal, which was reached in 2015 with the United Nations Security Council and the European Union. The Obama-era pact offered Iran billions of dollars in sanctions relief on the condition that the country curb its nuclear program. Watch the full speech in the video above.